Another C is often the first thing that is thought about when looking at purchasing any form of diamond, Cost. Across the various specifications for diamonds you will see that there are ways in which you can get the best value for your budget. You need not get the highest quality to get something that is equally as beautiful for your desired diamond. Understanding the factors that influence price and what they are in reality is essential and allows you to make the best informed decision about what criteria offer the right compromise for your budget, setting your own personal levels of compromise within the scales. While the choice of diamonds may at first glance appear overwhelming and while there are many more specifications that can be taken into account the choices needn't be perplexing and remember, ultimately, you're buying something that is a great vessel of value, and can be passed along for many generations. Carat weight is one of the fundamental factors in determining the price of a diamond. As a general rule, the heavier the diamond, that is, the larger the carat weight, the more expensive it becomes. Price per carat is one of the best ways to compare the cost of similar diamonds. To calculate this, simply divide the cost of each stone by its carat weight. Because they are more scarce, larger diamonds are in much higher demand than smaller stones and therefore command much higher prices per carat. A diamond that is double the size of another can be up to four times the price. For example, a one carat diamond solitaire ring is nearly always more expensive than a diamond ring made up of smaller multiple diamonds whose total weight is one carat. Diamonds are usually cut to a rounded number in their carat weight, for example 0.70ct or 1.00 carat, rather than 0.69 or 0.99. Because of this, diamonds weighing just under the weight 'barrier' (e.g. 0.68ct or 0.69ct. ), are scarce but highly recommended as they cost less than diamonds whose weight has been rounded up. Similarly, diamonds whose weight slightly exceed the barrier are referred to as "oversized" and also offer great value for money as they have not been rounded up. How To Get The Value Without The Cost? Well, the above is true - but only for a very specific 1 & 2 carat diamonds which we recommend (and will explain below along with more actual diamond prices). The reality is that 1 carat diamond prices range from $2,500 to $19,000 and 2 carat diamond prices range from $7,700 to $72,000. Diamond prices are complicated. Their true value is determined by dozens of factors. At least that's what they often tell you. It's true, but it really doesn't have to be that complicated. Reading this pricing guide will easily save you 20-30%. In short - A diamond's value is set by its appeal. Trying to regulate the industry and create a standard for diamond comparison, a methodology of diamond grading was set by the GIA and it is called the 4Cs of diamonds. What Is The Diamond Price Chart? 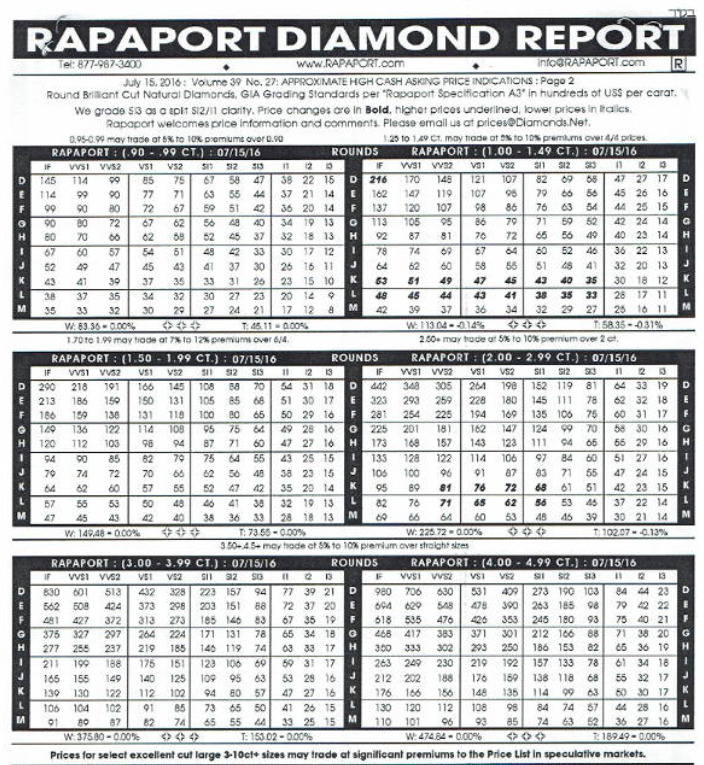 The diamond price chart, also known as Rapaport Price List or just "The List" is a matrix that provides a benchmark to a diamond's value based on its 4Cs. Since a matrix is two dimensional and there are 4Cs then there are several price charts - each is of a weight group. Also, Cut, even though often considered as most important C is not in the chart but is given weight by discounting diamonds that are poorly cut. As you can see, each cube / each matrix represents a weight class. On the left you have the diamond's color and on the top you have the diamond's clarity. To know the diamond's value, find your weight class's matrix, crosscheck the row of your color with the column of your clarity and you get the result. Just note that the results are in hundreds. Meaning that 89 is actually $8,900. Also, more importantly, diamond prices are per carat! A system that has its own disadvantages, or advantages if you know how to use it (explanation below). The problem with the diamond price chart is not what's in it but rather what's not. People tend to rely too much on the chart not knowing its limits. Consider the following two diamonds below - which do you like better? Hidden dangers in the diamond price chart. Both diamonds above have the exact same certificate - both are 1 carat diamonds, G color, excellent cut with VS2 clarity. The diamond price chart puts them both under the same value. However, given the black inclusion in the center of the table of the right diamond, we assume you'd prefer getting (or giving.) the one on the left. But, as you can imagine, you are not the only one to prefer the diamond on the left and therefore its value is indeed higher. The 1 carat diamond on the left costs $7,600 and the diamond on the right costs $6,500. As seen above, not all VS2 diamonds are alike and priced alike. And this is a problem that was caused by something that does get representation on the chart. What about attributes that are not on the chart? Cut Quality - Cut is interesting and many claim it's the most important of the 4Cs and for a simple and logic reason, you want a diamond for its brilliance and sparkle. If its poorly cut, who cares of its color or even size? Fluorescence - Diamond fluorescence refers to a bluish glow some diamonds reflect under UV light. Since it is considered a flaw, a defect, a medium to strong fluorescence reduces the price of 10-20%. Certificate/Lab - A diamond's certificate is often referred as a 5th C. All of the above are true only if you know what you have or what you are looking at and you should not trust the dealers word or expertise. When it comes to the certificate, you should only consider GIA. To make the point clear, when it comes to EGL vs GIA certificates, an EGL diamond may sell for as much as half the price of an equivalent GIA diamond. We chose these attributes both because in it is the only way to truly compare diamond prices and because in today's market you may not want to waive these qualities. With that in mind, you can always reduce the price by waiving a few of the above, the easiest and least affecting on appearance that does impact the price is the fluorescence. Going to a faint to medium fluorescence will reduce the price by 5-15% and at the same time, may actually cause the diamond color to appear whiter (a positive side effect of fluorescence). You should also remember that these are prices of loose diamonds. A price of a ring will set you back by another $400-$1,500 depending on whether you are going for the classic solitaire or a more expensive mount like a double halo and whether you go with gold or platinum. 1 carat diamonds are as classic as it may get when it comes to engagement rings. In fact, considering that the average engagement ring for the last few years is just beneath $6,000, 1 carat diamonds are probably as high as you can go. The marked cell of a 1 carat diamond for $6,000 with G color and SI1 clarity is our recommendation for best value for money diamond. It provides a good white diamond color that will work with both white gold and yellow gold and is basically as good as the eye can see. The affordable alternative to a 1 carat diamond would be running a wider search of diamonds weighing 0.90-0.99ct that are still cut very good to excellent but may include fluorescence. This search will get you a very similar looking diamond for approximately $4,350! And if you are going for yellow gold setting you can drop to H color diamond at $4,000. In recent years with the economic depression and the drop in demand for luxury goods, prices of diamonds declined - especially in such in bigger more expensive diamonds. As a result, the prices of 2 carat diamonds has decreased dramatically, in some cases 30% (though still very expensive) and they have become far more common. In order to make it easier, the above price chart is of total diamond prices and not per carat. Since these are 2 carat diamonds and the price steps are HUGE price wise, we have recommended three options. For $21,000 you get 2 carat diamond G SI1 - again the best value for money. However, due to the differences you may very well consider H SI1 or G SI2. Keep in mind that the SI2 diamond may not be "eye clean" - especially in a 2 carat diamond. This needs to be verified. 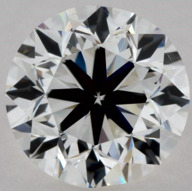 On the affordable side of 2 carat diamonds, dropping to 1.80-1.90 carat diamond and allowing fluorescence may get you a G SI1 for $14,000-$15,000! We don't know if you've noticed, but our recommended 2 carat diamond costs more than three times than the equivalent 1 carat diamond. There is a reason for that. For even better bigger savings, an advanced course if you will, if you are willing to break the mold of buying a perfectly weighing 1 carat diamond or a 2 carat diamond and buy slightly smaller carat diamonds like 0.90 carat or a 1.90 carat for an extra 10-20% discount - keep reading! What Does Diamond Price Per Carat Mean? Price per carat is the price of the diamond divided by its weight. The practical explanation is that if you see a diamond that is priced $5,000 per carat and it is half a carat what you'll need to do is 0.50 * $5,000 = $2,500 for the diamond. And if the same diamond that costs $5,000 per carat weighs 1.50 carat then it means 1.50 * $5,000 = $7,500 for the diamond. It may sound confusing or you may wonder why diamonds are priced this way but this is basically the same as fruits and vegetables are priced per lbs. This is extremely important because not all diamonds are the same and therefore should not be priced the same and the price per carat method allows you to better compare between two different diamonds. Consider the following example - A man walks to the store looking for an engagement ring to his future wife. He sees a beautiful classic solitaire ring with a center diamond weighing 1.10 carat with D color and VS1 clarity for $10,200. Later, as he walks down the street he sees another store with the same ring only that the center diamond is 1.02 carat and they want $10,000. Assuming that all other factors are the same, if we'll ignore the cost of the ring itself (which should not cost more than $500) we will see that while the first diamond is about 8% "bigger" it costs only $200 more which is equivalent to 2%. This means that the bigger diamond is the better deal. He pays a bit more and gets a lot more. It is important to know and understand that prices of diamonds increase with their scarcity. The rarer the diamond the more expensive it is. A high diamond color diamond costs more than a low color diamond not just because it is better color - but also because these are extremely hard to find. Same goes for large diamonds. It is by far harder to find a gem quality diamond weighing 2 carats than a similar diamond weighing 1 carat. As a result, the price per carat of a 2.00 carat diamond is higher than the price per carat of a 1 carat diamond. In other words, two 1 carat diamonds cost less than one 2 carat diamond - in fact - far less. How To Reduce Diamond Prices Using The Price Per Carat System? Let's ask you the following question - Would you rather buy a 1.00 carat diamond or a 0.99 carat diamond for 1% less? Same question regardng a 2.00 carat diamond and a 1.99 carat diamond for 0.50% less? Most people would rather walk the extra mile (or pay the extra 0.50%-1%) to get a round weight number diamond or more correctly not to get the "just below" carat weight. This is why ontop of what we mentioned above about the scarcity of diamonds causes higher prices, while diamonds are in fact priced per carat, the price per carat changes between weight steps or weight classes and as a result the prices of diamonds are not increasing linearly but rather exponentially - supply and demand. Meaning, that the price per carat of a 1 carat diamond is higher than the price per carat of a 0.99 carat diamond and thus the increase in total price is more than the 1% of the weight - much more. At the time of writing these lines a 2 carat D VS1 diamond costs $40,000-$42,000 total, approximately $20,000 per carat. A 1.90 carat D VS1 diamond costs $30,000 - which is $15,800 per carat - more than 20% less per carat and more than $10,000 total!!! And in case you wonder, we doubt if you could find a 1.95 carat diamond because the price difference is so HUGE that the diamond manufacturer would rather settle on the cut quality than dropping from 2.00 carat to 1.95 - this "drop" will cost him $10,000... And the diamond cutter's goal is not the brightest and most brilliant diamond but rather the most valuable one. Carat Does NOT Mean Size! Heavy men are not necessarily bigger. On the same note, heavy diamonds are not necessarily bigger! Just keep this in mind that "settling" on a diamond carat that is slightly less than originally intended (a "lighter" diamond) does not mean that it is smaller. And therefore, our advice to you, if you are on a budget (and we all are), instead of settling on other factors of the 4Cs (such as diamond color), you can step a little below the weight class that you had in mind and save A LOT of money. The weight steps which have an effect on the price per carat are: 0.50 carat, 0.75 carat, 1.00 carat, 1.50 carat, 2.00 carat, 3.00 carat, 4.00 carat, 5.00 carat and so on.